I feel like I've always had benchmarks to refer to in terms of time passing. Many times, the benchmarks have been based on schools I've attended, graduating, et cetera, but sometimes they're just based on life events. My "loser-on-a-beach" phase after I graduated college and took some time off from doing, well, pretty much anything. Ironically, I never went to the beach! When I graduated grad school and finally had time to enjoy life a little! It's definitely easier to compartmentalize parts of your life after you've lived them. Right now, I'm guessing I'm in the "honeymoon" phase of my life with Nick and the next big benchmark will be having a baby. It's weird, though, because I've always sort of been able to predict when that next phase will begin. But now it's sort of up to fate and biology more than a date circled on a calendar. How do you look back on your life? What "benchmarks" have you set in your personal history? 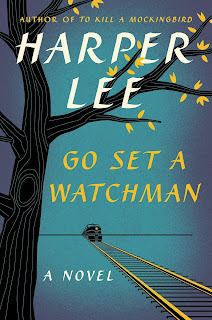 I don't often write book reviews, but I just finished reading Harper Lee's Go Set a Watchman, and I was so inspired to reflect upon it that I decided to devote a blog post to it. If you have yet to read the novel, I would recommend it especially if you have read To Kill a Mockingbird. But since I don't want to spoil it for anyone, you can click the button below to read my thoughts on the story. Here I am, sitting in an empty classroom during my planning period of the school day. I feel as if I've just been through some sort of emotional rollercoaster after reading Harper Lee's newly-published novel. I enjoyed To Kill a Mockingbird in high school and I have been anxious to read this latest story with the same beloved characters. I had heard rumors regarding the change of the perhaps most beloved character, Atticus Finch, and his racist attitudes and uncharacteristic behavior throughout this novel. Atticus Finch, racist? Never! How could this be? That's why it has taken so long for me to start reading it; I did not want my adolescent memories sullied by this new version of a man whose words I annotated and admired. Now that I have read it, though? (And in a matter of hours, at that.) I must say I am so glad I did. Even though Scout is referred to as "Jean Louise" for the majority of the novel, she'll always be Scout to me and I'm going to call her Scout for the purposes of my review. That being said, the story involves Scout returning to her childhood home, where most of the characters from Mockingbird still reside. She is residing in New York, as per Atticus' advisement, and just visiting her home in the South since she knows she does not have a place there anymore. The greatest conflict that Scout is struck by in the novel is dealing with the fact that her father is not the man she grew up knowing. She finds out he is attending council meetings with a group of white men who are trying to hold back the black race. She ends up getting physically sick from seeing Atticus seated beside a man who Scout morally opposes. She speaks to some neighbors, a lifelong friend, and her uncle about all of the changes she has been witnessing in the town. Finally, in a climactic rage, Scout explodes in a conversation with Atticus. She explains how she's been feeling let down, how she strongly disagrees with him, and how she cannot comprehend who he has become or how he has tricked her into believing one thing and then doing another. Simply, she feels betrayed. She describes her own beliefs and her own understandings of the Constitution, the state of the country, and politics in general. She is obviously unhappy with the man she has discovered Atticus to be at this point in her life. She never wants to see him again, nor return home. And to all of this fury? Atticus tells her he loves her and seems calm! With that response, Scout flees her father's office and goes to her childhood home to pack her things and head back to New York without another word. There, however, she is faced with her uncle, who literally slaps some sense into her. She takes a shot and calms herself. It is then she realizes that she's suddenly feeling like herself again. Not her childhood self, either, but her New York, adult-Scout self. A conversation with her uncle proves to bring about a realization that she has not killed her relationship with her father, but rather killed the link between their consciences. Prior to that moment, she had treated Atticus' word as the absolute truth. He was on such a pedestal that she regarded him more god-like than as a fellow human. When she spoke her piece and defended her own opinion to her father, she was able to come to terms with the fact that they were different and that was okay. At the close of the novel, she picks him up from his office and takes him home. She tells him she loves him and, while it seems like a very simple, everyday sentiment, it is a monumental moment for father and daughter. They argued, had a difference of opinion, Scout proved herself to have her own thoughts and strength of character, and they moved on. Sure, Atticus knew all along that he was human and he didn't have all of the answers, but it was a new experience for Scout to humanize her father. It is rare that we can truly understand a character's inner turmoil in relationship to a fellow character's words or actions. However, since I held Atticus in such high regard for this role in the classic tale many of us grew up reading, I was right there with Scout, wondering why Atticus was doing the things he was doing and why he had become the man he seemingly was. What happened to the man who had believed so wholeheartedly in justice and fairness? Did he believe the toxic words that were being spewed by others at the community meetings he attended? Did he no longer care for equal treatment of all men, regardless of race? I posted a new resource at my online shop yesterday. You can find it here. I post new products all the time, but don't typically mention them on my blog. I've decided to change that, though. I think that sometimes it's worth explaining how I would use a resource in the classroom or with a student I'm working with. It could give other teachers ideas that they wouldn't have necessarily thought of. 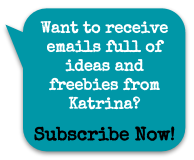 I hope it also invites other teachers to comment to share their ideas with me and any other educators who check out my blog. So here goes! This resource contains 21 student work pages as well as a cover page. Depending on how much paper and toner you're allowed to use at your school, I would either print a book for each student in my class, or I would create a few copies and put them in binders in plastic sheet protectors for a math learning center. Want to focus on a different number each week? Print out the page you need and allow the students to work on their printing and counting. Each page also allows students to color, which is a great way to develop fine motor skills, a crucial activity in early childhood classrooms. Printing out individual pages also allows you to focus on a specific number and ensures that students aren't "going ahead" in their booklets or misplacing their booklets, if you're planning on using them over the course of a period of time. If each student had his own copy of the booklet, I would have him work on it in various ways. It could be done in a whole group setting, especially if the students are just learning to write numerals and/or assign numbers to objects while counting. This is the type of activity I enjoy doing with the document camera over the classroom projector so the students can follow along. After doing a few pages as a class, I would allow the students to work on pages in small groups or individually. This is also a great independent activity for students. If they have this booklet in their desks and they finish another activity quickly (I know I always like when I'm working in a room where teachers have provided coloring sheets for early finishers! ), they can color some of the animals or work on their numeral printing. If you have a small printing budget in your school, a challenge I know many teachers are faced with, print out a few copies so that the students in a small group can utilize them. If you put the pages in sheet projectors, allow students to write with dry erase markers. At the end of their station, they can erase and the page is brand new for the next student to get to work. The only disadvantage is the lack of the tactile practice students gain when working with paper and pencil. I'm hoping to have some more resources posted soon! I have a few new ones I just need to get posted. I hope you'll find them beneficial in your classroom. Is it just me, or does everybody get irrationally stressed out about their lives around their birthday? I turned 29 on October 31st (yes, yes, I know... Halloween! Yay! Omigod, do you get candy and presents?! That must be the best. day. ever.) and I have to admit... It was tough knowing this is my last birthday in my twenties. Don't get me wrong, I feel like I have so many amazing things in my life to be happy about and thankful for. I have an incredible husband, an awesome family, and great friends. I live in a great house in a wonderful neighborhood that I really like. I have two super energetic puppers who I know I couldn't live without. I have the privilege of cooking a yummy and (basically) healthy dinner every night. I can enjoy downtime in many ways, whether it's watching television, going to the movies, reading on my Kindle, writing, talking a walk, or going out. I have my health and energy to do things. I can list the people in my life who I feel fortunate to have, the things I am lucky to own, and I can admit that when someone asks me what I "need", I have trouble coming up with a response. But now, at 29 years of age, I feel as if I fall short in other aspects... I don't have a full-time job, which makes me feel financially unstable and dependent, and I'm not a mom, which makes me feel behind and, frankly, a little bummed out. I know, it's a big taboo thing... Women are supposed to feel "enough" just on their own. They don't need men or babies to be complete. They don't need to prove themselves in any way. They are enough on their own. And I agree. I am enough. I try to be a good human being. I try to be a person I would enjoy knowing. I try to forgive myself when I make mistakes. I try. I really do. But there's nothing wrong with wanting to be a good wife and a good mother. It doesn't make me weak to admit that the moment I look forward to most in a day is when I get to see my husband and talk about our days. It doesn't make me an anti-feminist to express the desire to have babies and raise a family with the man I love. And honestly, I get annoyed when I'm criticized for being this way. So I guess we'll see where I'm at when I reflect upon my life when I turn 30. Here's hoping I have a baby bouncing in my lap instead of a pupper! 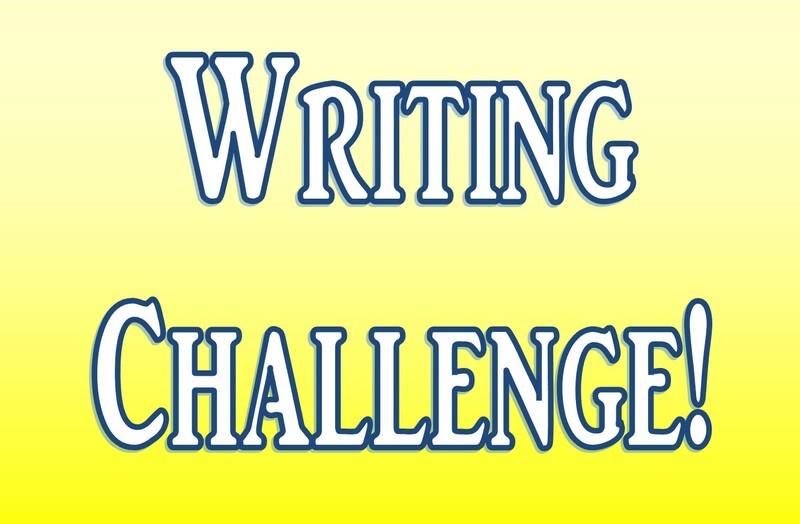 November's writing challenges are ready for your review! Describe a road on which you frequently travel. What is the traffic like? Describe the landscape. What kind of structures are present on the street - homes, retail stores, businesses, parks, farmland? What have you found to be the strangest fashion statement that you've experienced firsthand in your life? Why do you find it strange? Is it popular today? If not, when was it popular? 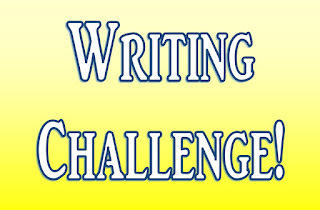 Write about the things in your life that you are most thankful for having, earning, or enjoying. The challenge? Write a letter to yourself regarding the people or things you are most appreciate of in your life today.